Western blot analysis of extracts from various cell lines using CD141/Thrombomodulin (E7Y9P) XP® Rabbit mAb (upper) or β-Actin (D6A8) Rabbit mAb #8457 (lower). Immunoprecipitation of CD141/Thrombomodulin from THP-1 cell extracts. Lane 1 is 10% input, lane 2 is Rabbit (DA1E) mAb IgG XP® Isotype Control #3900, and lane 3 is CD141/Thrombomodulin (E7Y9P) XP® Rabbit mAb. 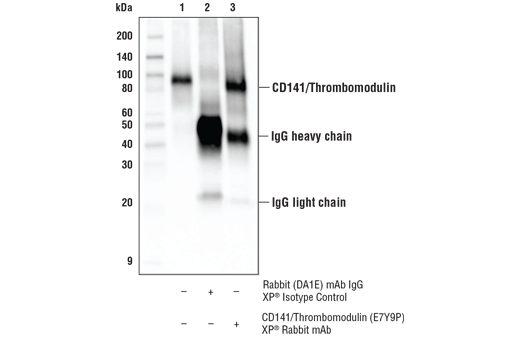 Western blot analysis was performed using CD141/Thrombomodulin (E7Y9P) XP® Rabbit mAb as the primary antibody and Anti-rabbit IgG, HRP-linked Antibody #7074 as the secondary antibody. 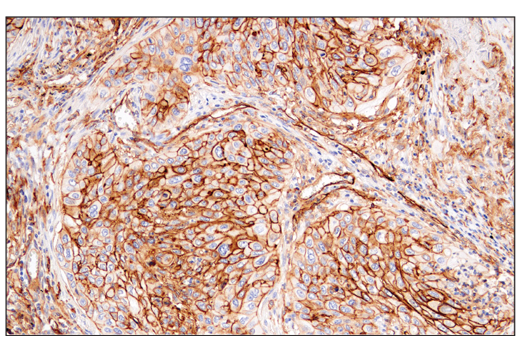 Immunohistochemical analysis of paraffin-embedded human urothelial carcinoma using CD141/Thrombomodulin (E7Y9P) XP® Rabbit mAb performed on the Leica® BOND™ Rx. 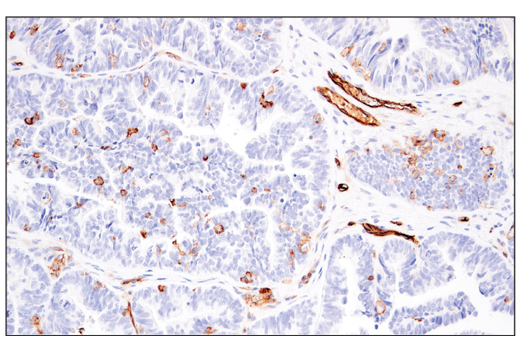 Immunohistochemical analysis of paraffin-embedded human gastric adenocarcinoma using CD141/Thrombomodulin (E7Y9P) XP® Rabbit mAb performed on the Leica® BOND™ Rx. 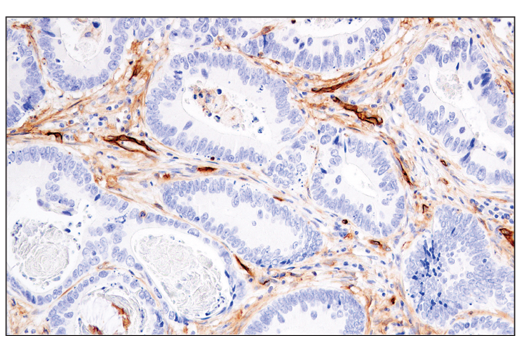 Immunohistochemical analysis of paraffin-embedded human colon carcinoma using CD141/Thrombomodulin (E7Y9P) XP® Rabbit mAb. 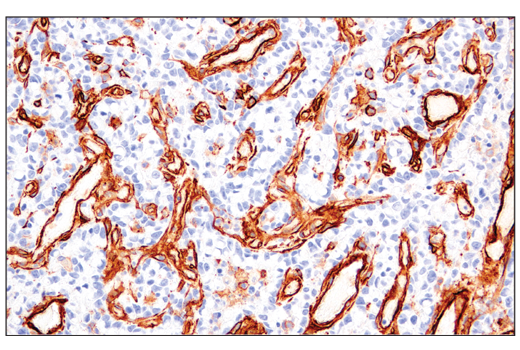 Immunohistochemical analysis of paraffin-embedded human squamous cell lung carcinoma using CD141/Thrombomodulin (E7Y9P) XP® Rabbit mAb. 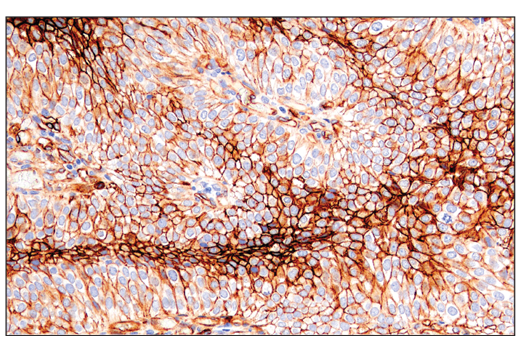 Immunohistochemical analysis of paraffin-embedded human lymph node using CD141/Thrombomodulin (E7Y9P) XP® Rabbit mAb. 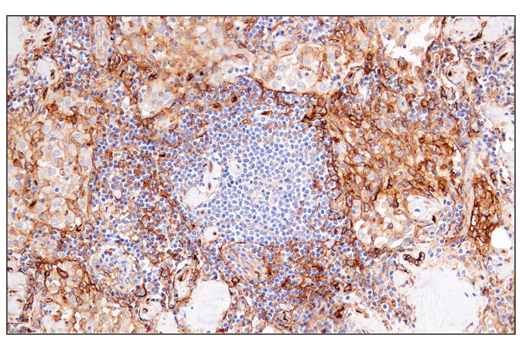 Immunohistochemical analysis of paraffin-embedded human serous papillary carcinoma of the ovary using CD141/Thrombomodulin (E7Y9P) XP® Rabbit mAb. 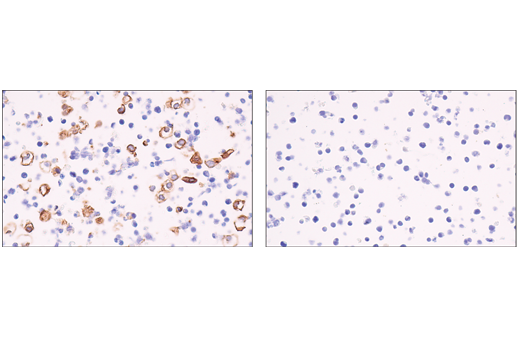 Immunohistochemical analysis of paraffin-embedded THP-1 cell pellet (left, positive) or Jurkat cell pellet (right, negative) using CD141/Thrombomodulin (E7Y9P) XP® Rabbit mAb. 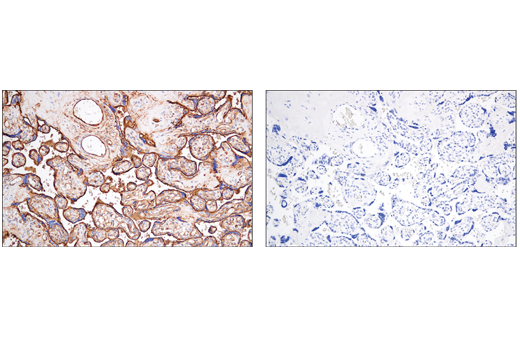 Immunohistochemical analysis of paraffin-embedded human placenta using CD141/Thrombomodulin (E7Y9P) XP® Rabbit mAb (left) compared to concentration matched Rabbit (DA1E) mAb IgG XP® Isotype Control #3900 (right). 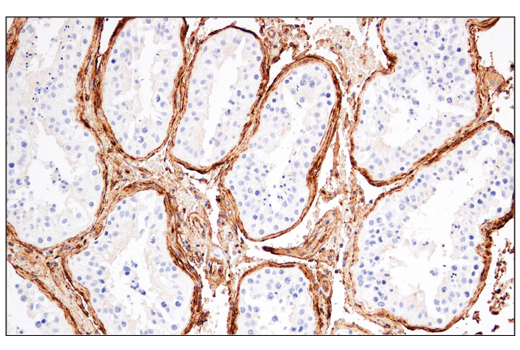 Immunohistochemical analysis of paraffin-embedded human testis using CD141/Thrombomodulin (E7Y9P) XP® Rabbit mAb. Thrombomodulin (E7Y9P) XP® Rabbit mAb recognizes endogenous levels of total CD141/Thrombomodulin protein. Monoclonal antibody is produced by immunizing animals with human CD141/Thrombomodulin recombinant protein. 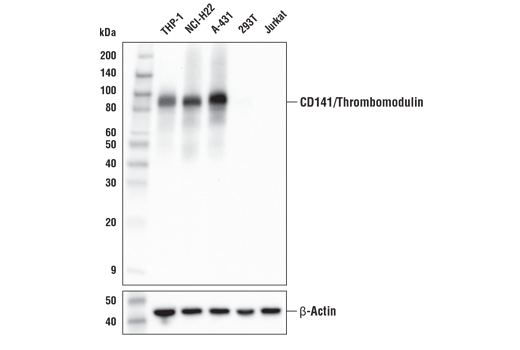 CD141/Thrombomodulin (TM, THBD, BDCA-3) is an integral membrane protein expressed on the surface of endothelial cells (1). Acting as a cofactor with Thrombin, CD141/Thrombomodulin activates and initiates the Protein C anticoagulant pathway (1-2). CD141/Thrombomodulin is expressed by a small subset of human CD11c+ myeloid dendritic cells (3-4). These CD141+XCR1+ dendritic cells cross-present antigens to naïve CD8+ T cells, priming them to become activated cytotoxic CD8+ T cells (3-5). Esmon, N.L. et al. (1982) J Biol Chem 257, 859-64. Esmon, C.T. et al. (1982) J Biol Chem 257, 7944-7. Dzionek, A. et al. (2000) J Immunol 165, 6037-46. MacDonald, K.P. et al. (2002) Blood 100, 4512-20. Bachem, A. et al. (2010) J Exp Med 207, 1273-81.